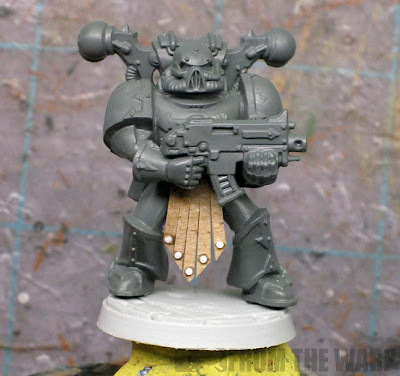 In the process of building my Sons of Horus terminator, I stumbled upon a super easy way to make leather strap tabards. Here's the process. You're going to need your model, some cardstock, your hobby knife and superglue. If you use something in particular for rivets, you'll need that too. Make sure your hobby knife has a new blade, you don't want to try this kind of detail with an old, dull blade. As far as cardstock, this is the secret part. I use cereal box cardstock when doing this. I've found it to be the perfect thickness for this. It's slightly thicker profile gives the leather some heft and the straps don't appear to be made of paper strips and super fragile. You could use just about any cardstock when it comes down to it... you just want something that is slightly thicker so you end up with some heft. Another really nice option I've found is the cardstock on the back of notepads. It's about the same thickness as a cereal box but it has the added bonus of not having that silly, gloss surface on one side. I prefer this when I can get my hands on it. You start out by cutting the approximate shape you want your tabard to be. Have your model nearby for scale purposes. 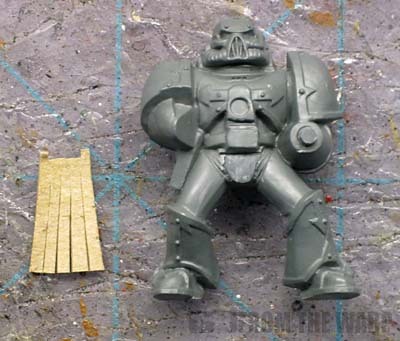 You have two options when it comes to mounting your tabard to your model. You can cut it to fit and mount it under the model's existing belt buckle or you can remove what's there and make your own. I've done both and it comes down to the look I want in the end as to which method I use. 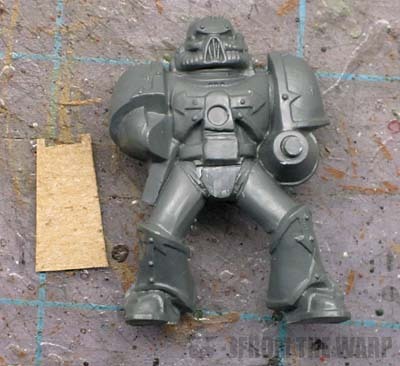 It's worth noting that you may need to cut away some of the front of the groin area on the model to allow for the tabard to be glued in place without it sticking all the way out and looking out of place. It's easy enough to do and you don't have to be worry about being perfect since you're covering the area up anyway. In this example, I'll be mounting it under the existing belt buckle. That means once I have the width I want my tabard to be, I need to cut a small notch out of the top to allow the tabard to fit right up against the underside of the buckle without a gap. A few cuts later and some test fitting I have just enough cut away so it fits in there perfectly. Cutting the individual straps is easy enough to do as well. Sine the object is small, you can simply cut a series of lines into the material making sure to keep each one the same width for visual consistency. If you mess it up and end up with one that is too narrow or make a mistake elsewhere, it's nothing to cut a new tabard real quick and start over. If you're not sure from the beginning, use a pencil and draw in some lines for the straps before cutting away. Gluing the tabard in place is simple. I give mine a very slight bend so that it conforms to the surface of the model a little better, but it's not necessary. Once the glue has dried, you can use your fingers to shape the straps in the direction you want by pushing them backward or pulling forward to give the tabard a sense of movement. Match the movement of the tabard up with the model and presto, it looks like it's been there all along. Adding rivets can be done to taste. I use a very thin piece of plasticard rod and cut off small cross sections that I glue in place. When it comes to painting, I paint it up as I would any other part of the model. Prime as normal, basecoat along with highlight and shading. Nothing different. And don't feel like you have to use the same shape for your tabard every time, I made ones that were squared off on the bottom and some that were angled. It all comes down to what you think looks best on the model. Dude, where the Hades do you come up with this stuff? Peyote sweat lodges? Freaking awesome! That looks well cool, cheers for the tip! Ron this is simple, cheap and effective. Green Stuff Industries: Glad you like it. I never thought of it before and I couldn't keep it to myself. One Man's Armies: No problem! D.W.G. Wals: Those are the best hobby tips... cheap and effective. This is a great tip. 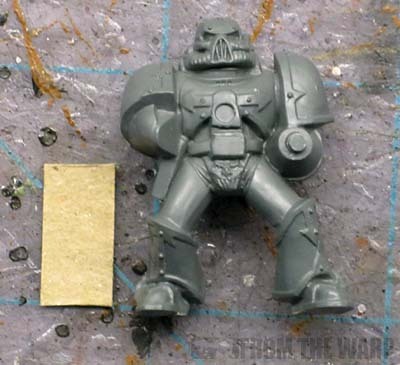 What model is that by the way, is it one of the snap-fit CSMs that come in a little box of 3? It looks surprisingly good for that. Bog Witch: Yep, he was my last one. I bought them with the sole purpose of using them for things like this. He's been painted up as an Alpha Legion marine as well that I'll posting soon. Needs a bit of greenstuff over the top followed by a light rolling of the clay shaper to add a little oomph to it, but great starting point. This would certainly work as is for tabletop results. A little greenstuff might help for a better or high end model to really get a nice look. Oh, Ron, don't think I was bad-mouthing your work, I wasn't! It just seemed to me the logical next step, while requiring no real work, was what I mentioned. Oh no, I didn't think that. There's always ways to improve a process. It comes down to blending different things until you can get the results you want. Hi, if you buy Kellogg or Post cereal most of them do not have the glossy coating on the printed side. Anon: I did not know that... unfortunately, the Wife and little one are quite particular with their cereal tastes and I have to work with what I can. Darrne: It's perfect for Veteran models as a way to make them stand out. How sturdy is it? I just have visions that while painting it it will just move and in transit etc it will move about and rip? Could the same be done for creating straps or belts maybe? I want to give a couple of my Imperial Guard veterans swords or axes hanging in a scabbard could I use plasticard or cardboard to make strap? Chris: I've found it to be more than sufficient for regular game play. The cardstock has some flexibility, but it's not it a place that you handle the model and ripping it would take a deliberate action. You can do the same thing for belts and such and I've used this idea to make a gun sling. In that case, I used very thin plasticard which does the very same thing really.